How lovely to meet up with some fellow bloggers and enjoy a delicious meal and conversation. Those desserts look delicious. I love chocolate souffle. I love that pretty tea cup; such a pretty design. I love that teacup; such a cozy little scene on it. And . . . I'll have to pass on the pie, or I'll never fit into my MOB dress! Looks delicious though. What a fabulous day out; and fancy refusing to give your recipe to the President! Kitty, I'm so glad y'all got to meet for lunch! I was planning to come but wasn't able to change an appointment that was scheduled that day. I know it was wonderful to be together. Happy Independence Day, Kitty! I always enjoy learning about and drooling over yummy desserts on your blog. How fun to meet some fellow bloggers! It really is a small world! Oh yay another awesome recipe to try out! Neat story - but yes, very surprising he wouldn't share the recipe - wow! I made your lemon ice box pie recently and it was sooo good, a new favorite. I may even make it again today - when it's warm it is the perfect pick-me-up! Glad you met up with friends! Next time we absolutely must meet when you are visiting here. If just for a half hour, and I will come to you even! Or you bring your momma here for tea and cake. I'd love to meet you both! I had to add to follow yet again - keeps knocking me off for some reason! Hate that! Kitty,I love the teacup this week. So pretty. How fun to meet up with bloggers for lunch. Looks like a wonderful place to have lunch. Glad you had fun. I'm passing the pie recipe on to my pie baking son. It sounds like a good one. Have a Happy day today and a wonderful week! What a joyful time to meet up with two blogger friends! The food sounds fabulous, especially that bread pudding souffle. I have just recently made a souffle because I was always afraid they would fall on me. But it turned out perfectly and I was so pleased with myself for braving it! ;-) I will certainly be trying to make more of them. Your buttermilk pie looks scrumptious. Can you imagine, the Steward saying, "No," to the President's request for the recipe? How silly is that! Thank you for sharing the recipe and for joining me today. Happy 4th of July, my friend! Have a marvellous day! Oh, I forgot to mention your sweet teacup. 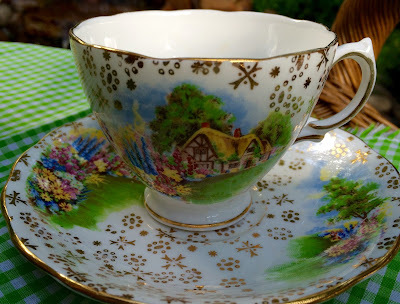 It's lovely and would be a favourite of mine because I love those scenic and cottage teacups! Oh Kitty...how wonderful you were able to meet! And looks like a delicious get together too! I absolutely love your teacup! And your teacup planter and Begonia is so cute! Thanks for linking to Tuesday Cuppa Tea! Kitty, Rise is my favorite restaurant in Dallas. 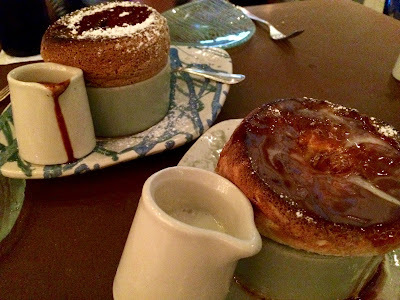 I love the souffles, but the French decor is truly special. There is no place like it! Happy 4th of July! It's so fun to meet up with blogging friends. I had the joy of doing so on a trip to Florida several years ago. My daughter (who no longer blogs) made dear friends through blogging---so dear, in fact, that they were all bridesmaids in each others' weddings. Happy 4th! So glad you got to meet up with some bloggy friends! The pie looks delicious! Hope all is well. 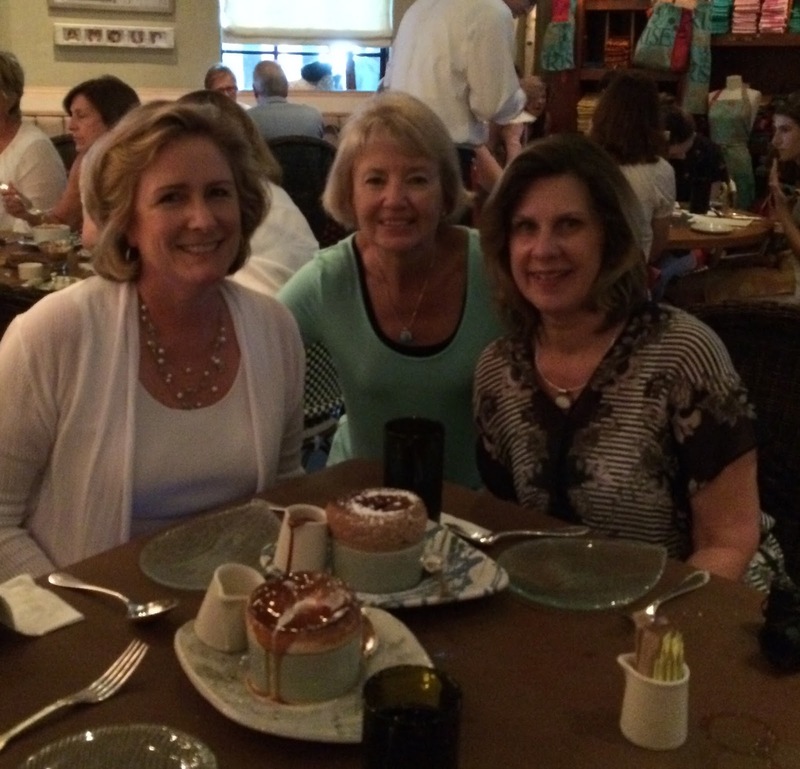 Hi Kitty, how fun to meet up with two wonderful bloggers. Isn't it fun? and especially at a wonderful restaurant. Love your pretty teacup too. The design is beautiful. Thank you for sharing the pie recipe. Oh it looks so good. Hope you've been enjoying a great 4th of July. It's mighty hot here. Stay cool. Kitty, Love your post today because I'm remembering our outing at Rise. What a good time we had. 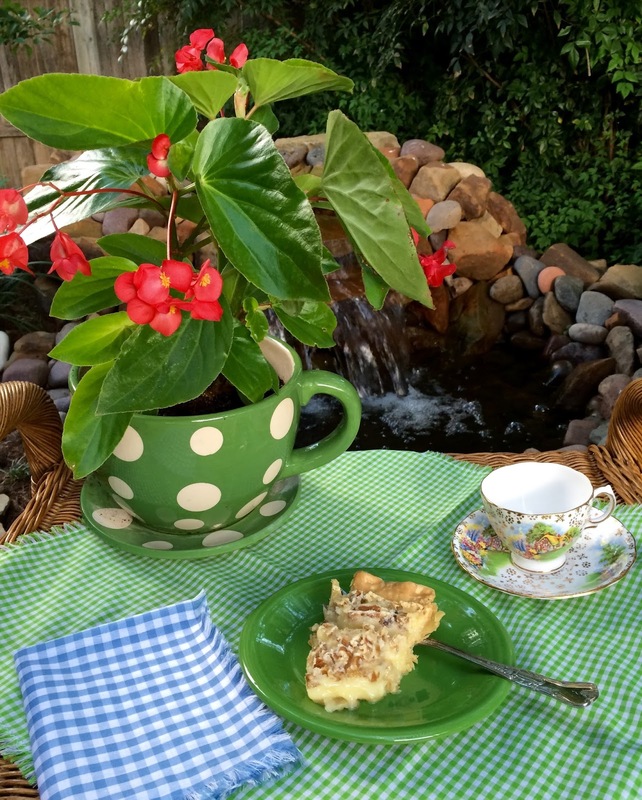 Your buttermilk pie sounds delicious and what a pretty table with your lovely new teacup. 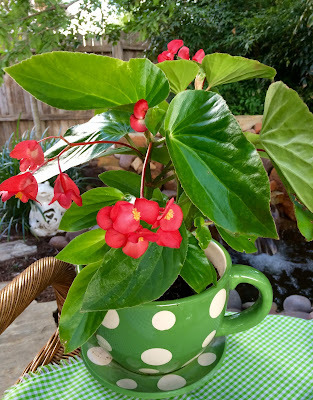 Your begonia is so healthy you'll have to repot it soon. Funny, as I was writing this your name flashed across the screen and you were visiting me. LOL! Oh what a wonderful post. The pie looks wondermous..I would love it. I get SO excited when I get to meet blogging friends...and my heart did a cartwheel for you getting to meet up with 2 of your special blogging friends. Awesome! Thanks for sharing the recipe...and the story behind it. =) Have a beautiful week. That looks like a really fun gathering of some very interesting women! I shall check out both their blogs shortly....thanks for the links to them. Kitty, I was IN McKinney TX about 16 years ago. Ern's son lived in Plano & they took us antique shopping one day. I almost bought a $90 pink depression bowl but feared it would get broken on the way home. I still think about missing out on that one. LOL Thanks for the pie recipe...yours are always the BEST!! It is so nice that you met up with a couple of bloggers for a lunch that looks absolutely delicious. I'd want to try this pie before baking it myself as fruit pies are what we eat most. I did hear of something different recently and that was a date and cream pie. A woman I met makes them for church dinners - are you familiar with this type Kitty? I do enjoy meeting bloggers. I also see a sweet teacup :) You share YUMMY recipes, thanks! Kitty, how wonderful to be able to meet Eilis and Bonnie! I love hearing when blogging friends connect, making a bit of effort to seek out those we've met virtually. Your recipe looks delis, thank you for sharing. I hope you have a great week. I've enjoyed meeting up with blogging friends. I've always been delighted to find that we have as much to talk about in person as we do online! Your lunch looks really good, and I think my husband would enjoy that pie! 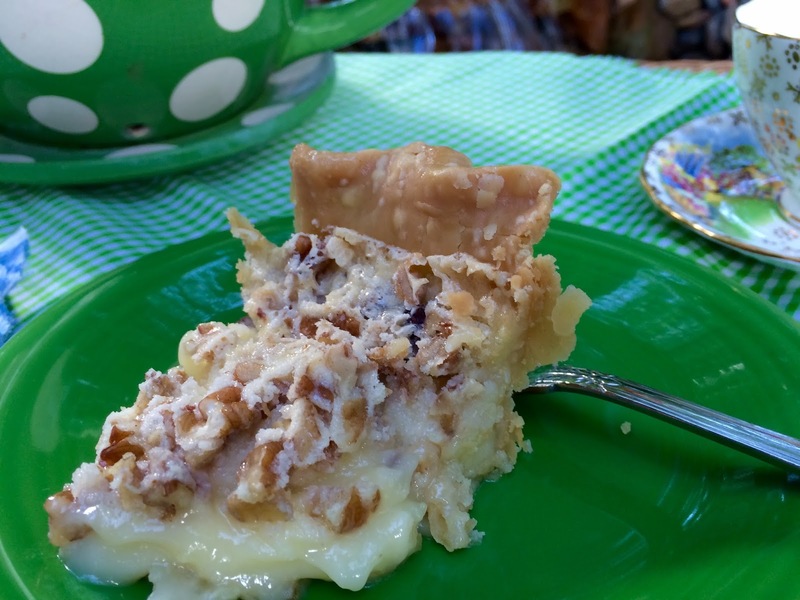 I've made buttermilk pie before but never with nuts. I'm definitely going to try this version! PS It is so fun to meet blogging friends! Hi Kitty, I hope you had a nice Fourth of July! I just love that little cottage teacup and saucer -- so pretty!! The teacup planter is just charming; anything with polka dots gets my vote. ;) I enjoyed reading about the buttermilk pie recipe. I love to make buttermilk pies; I use a recipe from my Mitford Cookbook. It's wonderful that something so simple to make can be so delicious. First what fun to meet up with more blogging friends! The food at RISE looks delicious! Looks like you all made a wise choice to dine there! Love that little polka dot tea cup planter! Very cute! I was thinking about using some teacups to plant some herbs in for my kitchen window!! I am curious about that buttermilk pie recipe. Have never had anything like that before. It looks absolutely delicious...I think the oozing pie fillings of yours get me every time. LOL! gotta try that pie too! What a wonderful recipe to share with us at Cooking and Crafting with J & J! It's great meeting blogging friends. Looked like a good time and nice dessert. The tea cup reminds me of Ireland, not that I have been. I hope you had a really lovely 4th! If there is anything finer than meeting a blogging friend, it's meeting two and at such a nice eatery. Sounds as if you all hit it off! No, I can not imagine being rebuffed on a recipe. What is up with that?! I love Buttermilk Pie but this recipe is a bit different. Can't wait to try it! I've never understood "why" people won't share recipes. I consider it an honor. Hi Kitty...what a lovely post. That pie recipe looks so unusual, but yummy. I don't think I have ever had a piece of pie like that! Hope you had a nice 4th of July. First of all, such great fun at the table and then the story about Truman! I loved it all! I am printing the recipe. Thanks for sharing and linking. Hi Kitty, sorry I'm late but I've been catching up today after being away. I love your sweet teacup and the angel wings in the green cup. The pie sure sounds delicious! Isn't is sweet to meet our blogging friends. Great pic! Hope you had a good 4th……. Kitty, I'm a little late visiting but tickled you got to enjoy time with blog friends! I think I've made a similar pie and it was delicious. Looks scrumptious, Kitty! And, of course, I love seeing your teacup collection. That one is very sweet! How sweet that you were able to meet up with some dear Blogging friends. I met Bonnie when I first started blogging as I know she found me through Stephanie's blog when she gave me a shout out on my first post, and I truly enjoy Bonnie. She is a jewel for sure. Kitty, how delightful! Perhaps one day, we can get together. That would be wonderful! Love your teacup and pie. Yum!! I am so sad about the shooting of the policemen in Dallas...breaks my heart the way the blacks and whites are so far apart. No problem - your picture is there! Thanks for sharing and posting but too bad we can't try the pie! Future technology now doubt! Kitty, how fun you gals got to meet up! Love meeting blog friends. And that pie, oh yum! I have heard of buttermilk pie, but never tried it. I can tell already that I will love it! Thanks for sharing with SYC. Oh how fun it is to meet fellow bloggers! So glad that you had such a lovely time with these lovely ladies! Your buttermilk sounds wonderful too. I love this post and sure would love your pie, it looks fabulous! Thanks so much for sharing with Full Plate Thursday this week. Hope you are having a great day and come back to see us real soon! Looks amazing Kitty, now I am hungry for one. LOL, thank you for sharing at Dishing it and Digging it link party. We love having you.